Too much controversy in the world today. A recent poll by Yahoo reported that San Francisco quarterback Colin Kaepernick, who is protesting the indiscriminate killing of blacks by law enforcement by refusing to stand during the national anthem, is the most hated man in the NFL. The same poll said 44 percent of NFL fans will stop watching the NFL if the protest continues … or spreads. The last part of that poll is laughable. It’s just another case of NFL fans behind blowhards, which is what they — myself included — do best. NFL fans are not going to stop watching games for any reason. That question in this poll was simply designed as something else to try to trigger more controversy between black and white America. The first part of the poll is disturbing and hypocritcal. I blasted the national media a week ago for doing the same thing with Kaepernick’s protest, jumping on it and blowing it up and out of proportion with the simple goal of developing a controversy to produce website visits and TV ratings. However, completely by accident, the media started a national conversation on race I feel can be life-altering. And the media deserves nil, nada, absolute zero credit for starting that conversation. This national conversation on race — not all of it, but much of it — has resulted in sincere, soul-searching dialogue between football fans, football teammates, office workers, family members and all other segments of society. There is a problem with race in America. If you don’t see it, you’re blind, or ignorant. But what is different about this conversation — and whether you agree or disagree with Kaepernick’s actions — is that this conversation is not fading away. In fact, it is growing. What started as almost universal hatred toward Kaepernick, has mellowed … at least a little. I still see stupid memes on Facebook and Twitter that are disparaging to Kaepernick, in face, they’re downright racist. In spite of that, others are joining Kaepernick’s protest. It will spread to the NBA. I’m surprised it has not spread to Major League Baseball. What that means is the importance of this conversation is growing. It should not fade away. Athletes in the past have been blasted for not taking a stand: against domestic violence, against steroid use. Michael Jordon and Tiger Woods have been blasted by some for not using their platform to bring light to the race issue. Because they argue, athletes have a great platform in which to tackle social issues. There are millions of white sports fans in this nation who are fans of the NFL, MLB, the NBA and more. And many of their favorite players are black. A majority of players on their favorite teams are likely black. Hating someone you root and cheer for is not so black and white anymore. Why has this national conversation spread? And why do I think it will produce a positive result? Because Colin Kaepernick has nothing to gain by his stance. And he has everything to lose. I think much of America has come to realize Kaepernick’s protest is deeply important to him and something he thought long and hard about. And what happens next year, especially in Ohio, if Lebron James refused to stand for the national anthem, or in some fashion, comes out in support of Kaepernick. Will Lebron’s legions of fans — many of whom are white — exhibit the same hatred and contempt for him as they have toward Kaepernick? There’s another reason I feel Kaepernick’s protest will be longer-lasting than others and is being discussed more and analyzed more than other similar protests. This is a grassroots protest, started by a man much of America had no knowledge of six weeks ago. It was not started, nor jumped on, nor had its thunder stolen by the usual cast of characters: Al Sharpton, Malcolm X and Jesse Jackson. Those three have such a polarizing effect on this nation that anything they say is immediately discarded or dismissed by half of America. 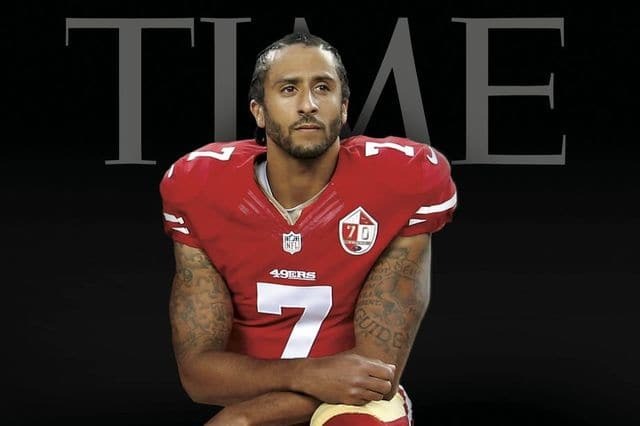 If next year Time named Colin Kaepernick its Man of the Year, it would be the first time I’ve agreed with its selection. This second string quarterback has started, or enhanced, and slightly altered a conversation this nation has needed for generations.